The Bannsiders will still be smarting from what they felt was a costly decision by the officials in last week’s Irish Cup semi final defeat to Crusaders. That cut off a potantial route into the Europa League for McAree’s men. But they still have another chance of heading to Europe through the end of season play-offs. McAree though admitted it was the last thing his players wanted to hear about following last week’s heartache. “Coleraine’s target is European football,” said the Bannsiders boss. “Our best way of getting that was by winning the Irish Cup. “But the poor decision by the officials last week crucified us and took that opportunity away. “But what can you do? You have to take it on the chin, pick yourself up and move on. 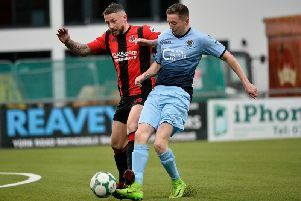 “When you go into the dressing room after losing an Irish Cup semi final like that, and you say to your players ‘We need to pick ourselves up, we need to go again’ players will look at you because they are hurting. Cliftonville are another club who also chasing that European dream. They had a morale boosting comeback win over Glentoran last week much to the delight of their boss Paddy McLaughlin. “I think the players have received a lot of unfair criticism this season,” he said. “If people want to talk about character and bottle, we saw that. “We didn’t have a good first-half and spoke about it at half-time. It was McLaughlin’s fifth win in seven games since taking over the Reds, and he praised two of his new recruits. “Aaron Harkin dictated things for us in there and I thought Niall Grace had an outstanding game,” he said. “They’re two players I know well because I’ve worked with them before.